From beginner to experienced competitor or caterer, we have a number of smokers that will meet your needs. We are now an authorized dealer for 270 Smokers! 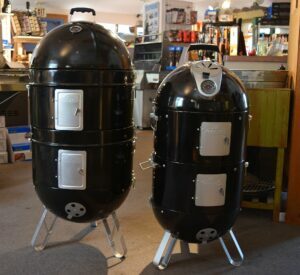 These smokers are perfect for anyone wanting more capacity without sacrificing temperature control. We sell Broil King & Memphis Pellet Grills. These grills can smoke, grill, and bake. They are the favorites of the "set it and forget it" crowd! We also stock cooking pellets all year long! Napoleon bullet smokers are affordable and produce great food, making them the go-to product for beginners and experienced users alike!